For other sieges of the city, see list of sieges of Constantinople. The siege and sack of Constantinople occurred in April 1204 and marked the culmination of the Fourth Crusade. Mutinous Crusader armies captured, looted, and destroyed parts of Constantinople, the capital of the Byzantine Empire. After the capture of the city, the Latin Empire (known to the Byzantines as the Frankokratia or the Latin Occupation) was established and Baldwin of Flanders was crowned Emperor Baldwin I of Constantinople in the Hagia Sophia. Constantinople captured by the Crusaders. After the city's sacking, most of the Byzantine Empire's territories were divided up among the Crusaders. Byzantine aristocrats also established a number of small independent splinter states, one of them being the Empire of Nicaea, which would eventually recapture Constantinople in 1261 and proclaim the reinstatement of the Empire. However, the restored Empire never managed to reclaim its former territorial or economic strength, and eventually fell to the rising Ottoman Sultanate in the 1453 Siege of Constantinople. The sack of Constantinople is a major turning point in medieval history. The Crusaders' decision to attack the world's largest Christian city was unprecedented and immediately controversial. Reports of Crusader looting and brutality scandalised and horrified the Orthodox world; relations between the Catholic and Orthodox churches were catastrophically wounded for many centuries afterwards, and would not be substantially repaired until modern times. The Byzantine Empire was left much poorer, smaller, and ultimately less able to defend itself against the Turkish conquests that followed; the actions of the Crusaders thus directly accelerated the collapse of Christendom in the east, and in the long run facilitated the expansion of Islam into Europe. The Massacre of the Latins (Italian: Massacro dei Latini; Greek: Σφαγή τῶν Λατίνων), a massacre of the Roman Catholic or "Latin" inhabitants of Constantinople by the usurper Andronikos Komnenos and his supporters in May 1182, had a dramatic effect on the politics between Western Europe and the Byzantine Empire. Although regular trade agreements were soon resumed between Roman Byzantine and Latin states, many westerners sought some form of revenge. Following the siege of Constantinople in 1203, on 1 August 1203, the pro-Crusader Alexios Angelos was crowned Emperor Alexios IV of the Byzantine Empire, who then tried to pacify the city. But riots between anti-Crusader Greeks and pro-Crusader Latins broke out later that month and lasted until November, during which most of the populace began to turn against Emperor Alexios IV. On 25 January 1204, the death of co-Emperor Isaac II set off rioting in Constantinople in which the people deposed Alexios IV, who turned to the Crusaders for help but was imprisoned by the imperial chamberlain, Alexios Doukas, who declared himself Emperor on 5 February. Emperor Alexios V then attempted to negotiate with the Crusaders for a withdrawal from Byzantine territory, but they refused to abandon their old treaty[clarification needed] with Alexios IV. When Alexios V ordered Alexios IV's execution on 8 February, the Crusaders declared war on Alexios V. In March 1204, the Crusader and Venetian leadership decided on the outright conquest of Constantinople, and drew up a formal agreement to divide the Byzantine Empire between them. By the end of March, the combined Crusader armies were besieging Constantinople as Emperor Alexios V began to strengthen the city's defences while conducting more active operations outside the city. By the first week of April, the Crusaders had begun their siege from their encampment in the town of Galata across the Golden Horn from Constantinople. On 9 April 1204, the Crusader and Venetian forces began an assault on the Golden Horn fortifications by crossing the waterway to the northwest wall of the city, but, because of bad weather, the assault forces were driven back when the troops that landed came under heavy archery fire in open ground between Constantinople's fortifications and the shore. On 12 April 1204 weather conditions finally favoured the Crusaders as the weather cleared and a second assault on the city was ordered. A strong north wind aided the Venetian ships near the Golden Horn to come close to the city wall, which enabled attackers to seize some of the towers along the wall. After a short battle approximately 70 Crusaders managed to enter the city. Some Crusaders were eventually able to knock holes in the walls large enough for a few knights at a time to crawl through; the Venetians were also successful at scaling the walls from the sea, although there was extremely bloody fighting with the Varangians. The Crusaders captured the Blachernae section of the city in the northwest and used it as a base to attack the rest of the city, but while attempting to defend themselves with a wall of fire they ended up burning down even more of the city. Emperor Alexios V fled from the city that night through the Polyandriou (Rhegium) Gate and escaped into the countryside to the west. The Crusaders looted, terrorized, and vandalized Constantinople for three days, during which many ancient and medieval Roman and Greek works were either stolen or destroyed. 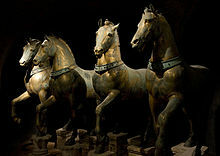 The famous bronze horses from the Hippodrome were sent back to adorn the façade of St Mark's Basilica in Venice, where they remain. As well as being stolen, works of immeasurable artistic value were destroyed merely for their material value. One of the most precious works to suffer such a fate was a large bronze statue of Hercules, created by the legendary Lysippos, court sculptor of Alexander the Great. Like so many other priceless artworks made of bronze, the statue was melted down for its content by the Crusaders. Despite their oaths and the threat of excommunication, the Crusaders systematically violated the city's holy sanctuaries, destroying or stealing all they could lay hands on; nothing was spared, not even the tombs of the emperors inside the St Apostles church. 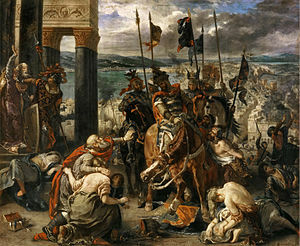 The civilian population of Constantinople were subject to the Crusaders' ruthless lust for spoils and glory; thousands of them were killed in cold blood. Women, including nuns, were raped by the Crusader army, which also sacked churches, monasteries and convents. The very altars of these churches were smashed and torn to pieces for their gold and marble by the warriors. Although the Venetians engaged in looting too, their actions were far more restrained. Doge Dandolo still appeared to have far more control over his men. Rather than wantonly destroying all around like their comrades, the Venetians stole religious relics and works of art, which they would later take to Venice to adorn their own churches. It was said that the total amount looted from Constantinople was about 900,000 silver marks, or 600,000 troy pounds. The Venetians received 150,000 silver marks that was their due and the Crusaders received 50,000 silver marks. A further 100,000 silver marks were divided evenly between the Crusaders and Venetians. The remaining 500,000 silver marks were secretly kept back by many Crusader knights. Meanwhile, Latin residents of Constantinople exacted their own retribution for the Massacre of the Latins of 1182. According to a prearranged treaty the empire was apportioned between Venice and the crusade's leaders, and the Latin Empire of Constantinople was established. Boniface was not elected as the new emperor, although the citizens seemed to consider him as such; the Venetians thought he had too many connections with the former empire because of his brother, Renier of Montferrat, who had been married to Maria Comnena, daughter and for a time heir-apparent of Manuel I. Instead they placed Baldwin of Flanders on the throne. He was crowned Emperor in the Hagia Sophia as Baldwin I of Constantinople. Boniface went on to found the Kingdom of Thessalonica, a vassal state of the new Latin Empire. The Venetians also founded the Duchy of the Archipelago in the Aegean Sea. The peasants and common riff-raff jeered at those of us from Byzantium and were thick-headed enough to call our miserable poverty and nakedness equality...Many were only too happy to accept this outrage, saying "Blessed be the Lord that we have grown rich", and buying up for next to nothing the property that their fellow-countrymen were forced to offer for sale, for they had not yet had much to do with the beef-eating Latins and they did not know that they served a wine as pure and unmixed as unadulterated bile, nor that they would treat the Byzantines with utter contempt. Byzantine aristocratic refugees founded their own successor states, the most notable of these being the Empire of Nicaea under Theodore Lascaris (a relative of Alexius III), the Empire of Trebizond and the Despotate of Epirus. The sack weakened the Byzantine Empire, which allowed neighboring groups such as the Sultanate of Rum, and later the Ottoman Turks, to gain influence (see the Byzantine–Ottoman Wars). In April 2004, in a speech on the 800th anniversary of the capture of the city, Ecumenical Patriarch Bartholomew I formally accepted the apology. "The spirit of reconciliation is stronger than hatred," he said during a liturgy attended by Roman Catholic Archbishop Philippe Barbarin of Lyon, France. "We receive with gratitude and respect your cordial gesture for the tragic events of the Fourth Crusade. It is a fact that a crime was committed here in the city 800 years ago." Bartholomew said his acceptance came in the spirit of Pascha. "The spirit of reconciliation of the resurrection... incites us toward reconciliation of our churches." ^ a b c d Phillips, Jonathan (2004). The Fourth Crusade and the Sack of Constantinople. London: Jonathan Cape. ISBN 9781448114528. Retrieved 22 October 2018. ^ The Cambridge Illustrated History of the Middle Ages: 950–1250. Cambridge University Press. 1986. pp. 506–08. ISBN 978-0-521-26645-1. ^ Gregory, Timothy (2010). A History of Byzantium. Wiley-Blackwell. p. 309. ISBN 978-1-4051-8471-7. ^ Vasiliev, Aleksandr (1958). History of the Byzantine Empire. 2, Volume 2. University of Wisconsin Press. p. 446. ISBN 978-0-299-80926-3. ^ a b David Nicolle, The Fourth Crusade 1202–04; The betrayal of Byzantium. (2011) Osprey Campaign Series #237. Osprey Publishing. ^ "Preface". Clir.org. Retrieved 30 December 2008. ^ a b Victor Roudometof, Globalization and Orthodox Christianity: The Transformations of a Religious Tradition, (Routledge, 2014), 47. ^ a b Donald M. Nicol, Byzantium and Venice: A Study in Diplomatic and Cultural Relations, (Cambridge University Press, 1999), 143. ^ Memory and ideology: the image of the crusades in Byzantine historiography, eleventh-thirteenth century, Aphrodite Papayianni, The Crusader World, ed. Adrian Boas, (Routledge, 2016), 284. ^ "The Latin Occupation in the Greek Lands". Fhw.gr. Archived from the original on 7 January 2010. Retrieved 29 December 2008. ^ a b Angold, Michael (1997). The Byzantine Empire 1025–1204. pp. 327–28. ISBN 0 582 29468 1. ^ "In the Footsteps of St Paul: Papal Visit to Greece, Syria & Malta – Words". Ewtn.com. Retrieved 18 May 2009. ^ "Pope Expresses "Sorrow" Over Sacking of Constantinople". Atheism.about.com. 30 June 2004. Retrieved 18 May 2009. ^ Connolly, Kate (30 June 2004). "Pope says sorry for crusaders' rampage in 1204". The Telegraph. Retrieved 1 January 2017. ^ "In Pascha messages, Patriarchs address question of violence". Incommunion.org. Archived from the original on 13 May 2009. Retrieved 18 May 2009. "The Medieval Russian Account of the Fourth Crusade – A New Annotated Translation".